In Norway, two guys turned on an app that imitates rabbit sounds. They wanted to attract a fox to take a good picture of it. They attracted it, but they didn't expect what happened next. 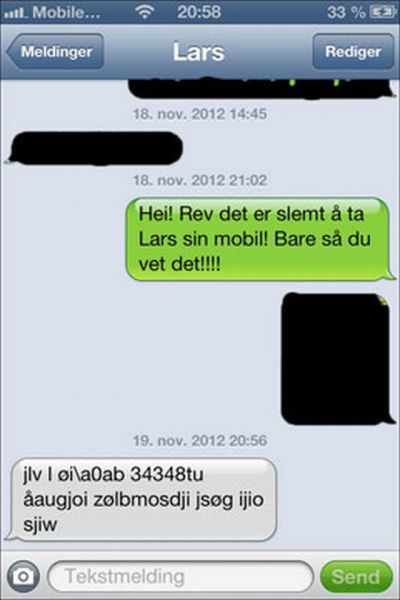 One day later a friend of the phone owner got a very strange sms. Did the fox send it? I wonder if they ever found the phone? Thats what a rabbit sounds like? I'll remember to never have a rabbit as a pet. What is that, a dying rabbit? i just know, that's how rabbit sound ? They clearly got the phone back.. The picture shows a text sent by the fox right? Honestly though he deserved to have the iphone taken for screwing with the fox. If only they could have turned the phone off. Anyway, what did they expect? The owner hasn't found the phone yet, the battery died 2 days after the phone was taken, and yes this is how an injured hare sounds, most likely a german hare. The worst sound they make is when they sound like a child crying, yep, you read it right, just like a child crying. Many people in Sweden has gone looking for lost children in the woods in the night. Therefore a lot of ghost-stories has been going around for hundreds of years of childrens ghost in the woods looking to find their way home.